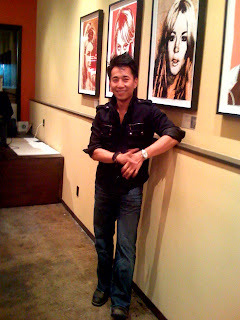 On Friday night I headed only 1.6 miles away from mi casa to see some Heroes (literally) at Demetrios Mavromichalis' Venice Grind Print & Art Gallery for the opening exhibition of “Hollywood Most Wanted,” an art showing of celebrity mug shots turned pop-art with enhanced colors and printmaking techniques. Zachary Quinto, the actor who portrays "Sylar" on NBC's television show Heroes, hosted the gala and as a result other Heroes cast members were present too. I was invited by Bungalow PR, who was responsible for the this hot party and with whom I do freelance work for. 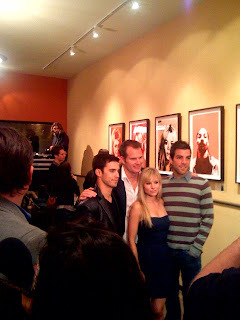 The tiny gallery was packed with TV celebs and being fans of the show, Raphael and I were in our element. In fact, I couldn't help but be momentarily frightened when the bad guy, Sylar, walked in the backyard party area, which had an open bar sponsored by p.i.n.k (vodka infused with caffeine) + Bluecoat American Dry Gin, plus appetizers being cooked outside by Nourish catering. Not having had dinner, we filled up on the bite size portions, which were all divine. While viewing the displays we spotted, Neil Patrick Harris, i.e. Doogie Howser, who has such baby looking skin that he looked not only young but pretty. He was there with another handsome guy, who I'm assuming was his date. Here's a photo though with Neil, Zachary and the artist Rachel Schmeidler. We also saw Heroes' dad, Jack Coleman, who we briefly chatted with by the bar. He shook my hand and shared that he liked the art show. He was the friendliest of all the stars there and looked handsome and generally comfortable in the crowd. What was really interesting though was to see that he and his on screen daughter, a.k.a. the cheerleader played by Hayden Panettiere (who I saw at the Tribeca Film Festival last year too) interacted as if they were really father and daughter. It was cute. In fact, when she entered the party in a short and stunning golden dress, she immediately ran right to Jack for a hug and to join in the photo opp with Access Hollywood, which was also there with a reporter and camera crew. I'm going to tape the show this week, in case I'm in the background ;). For more photos check out WireImage and here. The exhibit runs from now until Nov. 4 at 12222 Venice Blvd, Los Angeles, CA 90066. Update: I saw the coverage on Access Hollywood, short and sweet but no moi in the background. Ah well, at least I was there. Hmm I got to get a hold on those names, sounds fun and I HAVE GOT TO GO TO LA again one day!! OMG that's so awesome! But the girl from Veronica Mars is Kristen, not Katie. I can't wait until she's on the show! Oh that is what California is suppose to be about! woohoo...so jealous. I love heroes. omigod. i love heroes. the show is phenom! and i love p.i.n.k. vodka, that stuff makes anyone feel like a hero! yumz. I want to have Sylar's baby. I've heard Hayden is very down to earth.